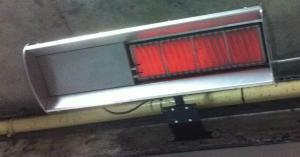 Reclaim your space back with wall mounted or suspended radiant panel heaters. Infrared heaters from SBM provide efficient heat without taking much space and energy, heating surfaces, and not volumes of air. SBM RI & XDI Series radiant panel heaters are available in a range of sizes and for operation on either Natural or LP Gas. Gas luminous heaters of these series range in size from 15 up to 48 MJ/hr [4.2 up to 13.5 kW] and are fully automatic in operation. All appliances are approved for use indoors in commercial and industrial premises. The RI 12 & 16 plus the XDI12 & 16 are also approved for operation outdoors when protected from rain and high winds at commercial and residential premises. The XDI Series are also available with coloured casings to blend in with the achitecture. We can provide you with complete and customized heating solutions with opportunity to select different temperatures for different working zones (working areas, production planning, etc).